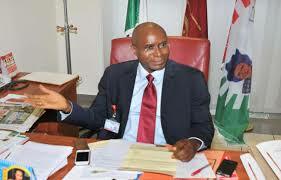 The lawmaker representing the Delta Central Senatorial District, Senator Ovie Omo-Agege, has carpeted the House of Representatives for approving his suspension over alleged involvement in the invasion of the Senate chamber and mace snatching. Omo-Agege described the resolution for his suspension by the House as an act of lawlessness. Omo-Agege had, however, dismissed the suspension and attended plenary on April 18. The lawmaker’s emergence at the chamber had occurred at the same time when suspected thugs invaded the Senate chamber while plenary was ongoing and made away with the mace. President of the Senate, Bukola Saraki, while inaugurating a joint National Assembly investigative panel which had the Senate’s Deputy Majority Leader, Bala Ibn Na’Allah and Rep. Betty Apiafa as co-chairmen, had noted that there were reports that those who attacked the Senate were led by a serving senator. The House had last week considered the report by the panel, which indicted Omo-Agege, and approved the recommendation that the senator be suspended for 180 legislative days. Na’Allah has yet to lay the report before the Senate. Omo-Agege, in his reaction, dismissed the resolution by the House and accused Saraki of being a dictator. The statement read in part, “Without much ado, I state without ‘equivocation’ whatsoever that the purported House resolution is just an act of utter lawlessness by one ordinary, first among equals in the Senate, who prides himself as a most intolerant dictator. The Urhobo people that I represent with honour in the Senate do not respect oppressors or dictators. Omo-Agege noted that there were several judicial decisions that legislative houses could not suspend their members, while matters of his suspension by the Senate and National Assembly’s investigation of the mace theft were before the court, making the action by the House subjudice. Reacting, Saraki’s Special Adviser on Media and Publicity, Mr Yusuph Olaniyonu, said senators who believed in the Senate President’s leadership would respond to Omo-Agege. Also responding to Omo-Agege, a senator loyal to Saraki dismissed the Parliamentary Support Group in the Senate, which has Adamu, Ndume and Omo-Agege as part of its membership, as a group of aggrieved lawmakers. The senator, who spoke on condition of anonymity, alleged that the lawmakers had been attacking Saraki for personal reasons.